Pour some milk into the dish, about 1/2″-1″ deep. 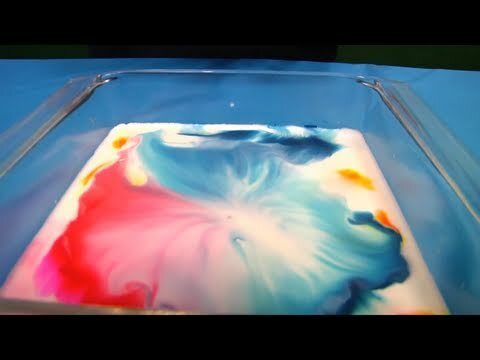 Place drops of food coloring into the milk. Be careful not to overdo it. Pour a little dish soap into a cup. Use a toothpick to pick up a dollop of soap, then drop it into the center of the milk. When it stops, you might give the milk a little jiggle to see if it starts up again. If not, put in a fresh drop of soap. Milk is a combination of water, sugars, minerals, and fat. The fat is key. Milk is also homogenized, which just means the fat has been broken up into very small pieces so it doesn’t clump together and form cream while the milk is sitting in the market or your fridge. Now, remember that fat part – its important later. Milk is also more dense than the food coloring. So that’s why the food coloring floats on top of the milk! And the fat in the milk keeps it from mixing in with the rest of the milk very well. Now, as for the dish soap, it is a surfactant. That means that the molecules that make up the soap have two ends – one end is attracted to water and one is attracted to fat. Remember that if you mix oil and water, the oil floats on top of the water – the two don’t mix. This is why it is hard to clean grease off dishes without soap – they don’t mix! But the soap allows them to mix because it can attract both fat and water. So, if we put it all together, the drops of food coloring float on top of the milk, surrounded by fats that don’t let it mix. But, when the soap is added, the fat and water in the milk are attracted to each other. This breaks the surface tension on top of the milk, causing milk that hasn’t mixed with the soap to rise up to the surface thereby dragging along the food coloring with it which creates the mix of colors that you see.